What is the Gymnic Home & Office Anti Burst Swiss Ball? To improve posture while sitting by maintaining good back posture. To prevent back pain, herniated disc, Sciatica and Lumbago. 55cm (22") diameter Swiss Ball for people 155-167.5cm (5' 2" - 5' 6") tall. 65cm (26") diameter Swiss Ball for people 167.5-175cm (5' 6" - 5' 9") tall. 75cm (30") diameter Swiss Ball for people 175-192cm (5' 9" - 6' 4") tall. This great product is just like a swiss ball, but it has 6 'legs' to stop it from rolling away. Use the PhysioRoom.com Faster Blaster Dual Action Pump to inflate the Gymnic Home & Office Anti Burst Swiss Ball. Then simply place the legs downwards on the floor and sit on the ball. The slightly unstable base improves your posture, prevents slouching and stops prolonged stress on the structures of the lower back. The ball is burst resistant quality. Even if damaged with knives, or other pointed objects there is no danger of sudden lack of pressure. WARNING: Not suitable for exercising with bench press and any kind of dumbells. The manufacturer and the distributors will not be held responsible for any incorrect use of the ball which should lead to injury. 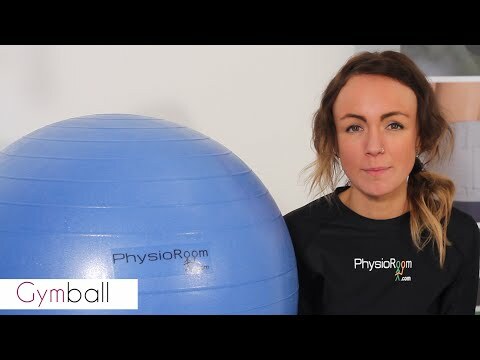 Gymnic Anti Burst Gym Exercise Ball - Yoga Pilates Fitness Balance Ball - Core Stability is in stock and available for immediate dispatch from our Warehouse facility in Lancashire, UK. Orders placed by 4pm Monday to Friday (excluding Bank Holidays) are dispatched the same day. If you need your Gymnic Anti Burst Gym Exercise Ball - Yoga Pilates Fitness Balance Ball - Core Stability in a hurry, next working day delivery is available for UK mainland addresses.